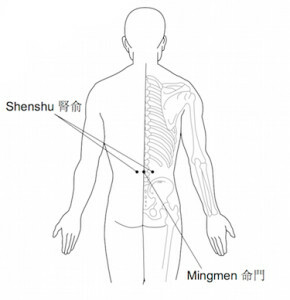 We have two acupuncture points either side of the Mingmen Point 命門. Since the Mingmen is like the backdoor, the Shenshu are obviously like the back windows to the Dantian. As the Mingmen is very important, anything next to it will also be important. “Shen” means” Kidney” and “Shu” means “PassThrough”, however Shu should actually be pronounced “Yu” in Mandarin. 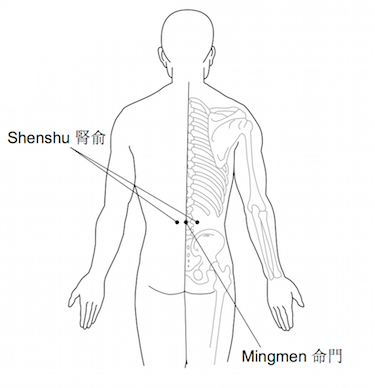 “Shenshu” means “the Qi passes through the Kidney area”. The Shenshu points belong to the Foot Taiyang Urinary Bladder Channel 足太陽膀胱經. In Chinese Medicine the Kidneys are Yin and the Urinary Bladder is Yang and so they belong together. If the Kidneys have a problem, then the Urinary Bladder will have a problem as in Chinese Medical principles, every part of the body is connected. This is the same as Chinese philosophy and principles, we are all connected. When we observe a person we should be able to diagnose their health problems from their appearance and attitude. Health affects our attitude, our behaviour, our luck and our future. This is what Chinese culture teaches us. The Shenshu points should be firm inside and the surface should be soft. When we touch them we should not feel any pain. When we have lower back pain, need to go to the toilet often, easily tired, lack focus and have hearing problems, this can be because the Kidneys have a problem and the Shenshu are blocked.